I will be doing a children’s learn-to-draw teaching demo event with Barnes & Noble in West Dundee, Illinois (Spring Hill Mall) on Friday, November 22nd from 5 – 7 p.m. This is a chance for children ages 5 – 12 to learn “How to Draw Star Wars Art.” I will be presenting this demo and coaching attendees on their drawing skills. If you live in the Chicagoland area and are looking for a really engaged bookstore offering family-friendly events, check out this particular Barnes & Noble. If you’re in the Midwest and looking for a family-friendly comic book convention, Indy PopCon in Indianapolis May 30 – June 1st will be the show to attend. This new show is run by my friend Larry Zore, of Comics Price Guide fame. If you’re an artist or vendor interested in being a part of Indy PopCon, please contact denise@writebrainmedia.com. Indianapolis is a really cool city to check out, and they have a wonderful children’s museum there. Remember to check out the critically acclaimed horror comic “The Other Dead” Issue #2 – it’s getting really fun as the tension builds. Issue #3 will be out soon as well. The Other Dead Issue #1 is sold out and reprints are in transition. The Other Dead Synopsis: Louisiana is Ground Zero for the animal kingdom to become zombified, as a Katrina-like hurricane bears down on Louisiana. I was pleased to hear that the Joliet Star Wars Day Library Event I’ve been participating in the last three years has grown to become the largest worldwide according to Lucasfilm, so that’s great news for the City of Joliet. I’m in the throes of clearing out my garage this week and I rediscovered my QVC appearance, so I will be digitizing that to throw online for you to have a good laugh. I also found my WEAR-TV (Pensacola ABC affiliate) appearance on BETA, so I’ll have to find someone to reformat it. I’m still missing my SciFi Channel appearance, so if anyone out there has video of it, I’d like to see it again. Today is the day your local comic book retailer starts carrying the IDW book THE OTHER DEAD (IDW), created by my friends Kevin Eastman (Teenage Mutant Ninja Turtles/Heavy Metal Magazine), Digger T Mesch, creator of Minimates and Art Asylum (Agent 88) and Joshua Ortega (Gears of War). 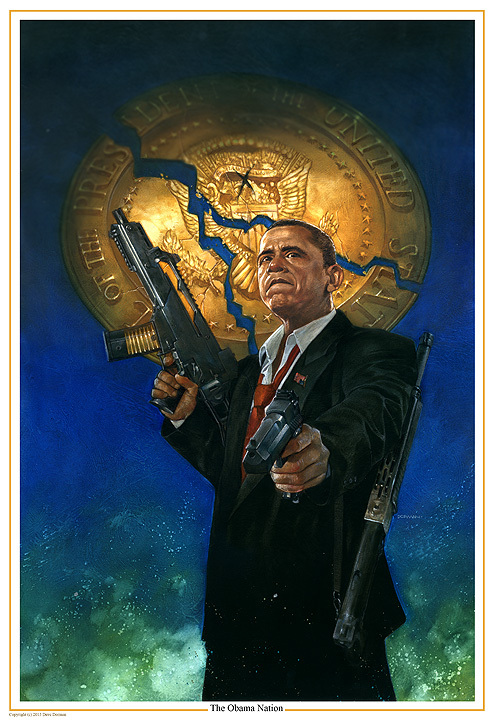 As you know, I did the “Obama Nation” 1:10 variant cover, which is already selling up on eBay, so I recommend you buy it up as soon as you can and get it signed by our crew. To celebrate the launch of THE OTHER DEAD, I am offering a strictly limited edition giclee print–limited to 57–of this controversial artwork. This archival print features the full art of this stunning portrait, unencumbered by logo or other printing. I am producing these prints directly out of my studio, so the quality of the end product is personally overseen by me. Limited To Just 57: This giclee limited to exactly 57 hand-numbered copies with my personal signature. How It’s Shipped: This will be shipped in a crushproof tube and tracked for convenient delivery. Price: The price of this limited print is $40, including postage (Foreign orders please include an additional $5). Where You Can Buy It: You may order this print NOW using this link to an order page on my website. Don’t let this Limited Opportunity slip thru’ your fingers! NOTE: The original painting is available for sale, but it won’t last long, so please message me for pricing details. TOMORROW — SEPT. 26th PAINTING DEMO — I will be doing a live painting demo at BLICK ART SUPPLY in Wheaton, IL from 2-4 p.m. so please come by if you can. I will be flanked by the 501st Star Wars Stormtroopers, so it’s a great opportunity for photo opps as well. If you have items you would like me to sign (such as THE OTHER DEAD comic), please bring your items with you. I hope to see you there. OCT. 5th — Star Wars Reading Day — Barnes & Noble, Spring Hill Mall, West Dundee, IL – from 2p.m. – 4 p.m.
OCT. 10 – 13 –New York City Comic Con — I will be doing New York Comic Con this year, joining Kevin Eastman, Joshua Ortega and Digger T Mesch at Tables Y1 – Y2. Board game enthusiasts: Be sure to check out my WASTED LANDS board game & trading card game prototype, IRON WARS, by Silent Gunfight. Mike Bawden will be there with me to demo it for you. It’s a combination strategy game of Risk-meets-Magic:The Gathering. We game tested it at GenCon and got great reviews on it, so I’m excited to move it forward. OCT. 25-27–Detroit Fanfare–I will have a table at Detroit Fanfare for this weekend, so bring the items you want signed! I will also have prints for sale. My final piece of news is that I’m honored to be named by Imagine F/X magazine most recent issue as one of the “Top 100 Fantasy Artists” in the world, so thank you for that, all of you who voted me in. Creators Joshua Ortega (Gears of War), Digger T. Mesch (Art Asylum, Mini Mates), Kevin Eastman (Teenage Mutant Ninja Turtles, Heavy Metal) and IDW Publishing are left to wonder when the book will hit retail shelves. The Other Dead is the first in the zombie genre to tell the tale of a zombie plague hitting the animal world, and the unexpected effect this has on the world. The Other Dead creative team is continuing to monitor the situation and will update the media as they learn of the retail fate of The Other Dead Issue #1. For breaking news, please “Like” Facebook.com/TheOtherDead. My Wasted Lands/RAIL project: The IRON WARS Game by the team at Silent Gunfight (Mike Bawden and Tim Bawden) is coming along nicely. We will have a playable prototype to show at New York Comic Con, which Mike Bawden and I will be attending in person this year! 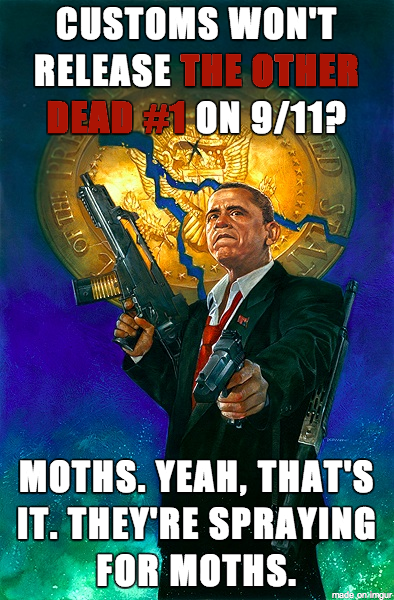 I will be joining the Artists Alley section with Kevin Eastman, Joshua Ortega and Digger T. Mesch, all of whom I partnered with in a variant President Obama cover for their The Other Dead comic book by IDW Publishing, plus I’ll be promoting my creator-owned work http://wastedlands.com. Since this is Labor Day, I thought I would share with you some of my thoughts on the fruits of my labor–my art work. During the 30 years of my art career, I taught myself many mediums to stay on top of my game. When I decided to begin painting, I blindly chose oil paints, because that’s what I thought painters used. I was very much a novice and didn’t know about acrylics. (Besides, my most influential artist at that time Frank Frazetta, worked in oils.) I taught myself how to paint with oils and used that medium almost exclusively for 20 years, before finally feeling comfortable with them! To remain competitive in today’s field, I am now being forced to learn a new tool–the digital tool. I have researched what I will need to work digitally, which is mainly software and a tablet. I have decided to get a CINTIQ tablet because that will offer me a more natural feel like traditional work; I will be able to watch my hand paint on the tablet surface without having to look up at a monitor from a separate tablet surface. I will work with PAINTER and PHOTOSHOP to start out, so if you are one of my many digital artist friends, don’t be surprised if you get a call in the middle of the night asking for help or tips! To fund this costly move to digital, I am offering my fans the rare opportunity to grab just a few of my ORIGINAL STAR WARS PAINTINGS for sale at a cost of just $2,000 each. 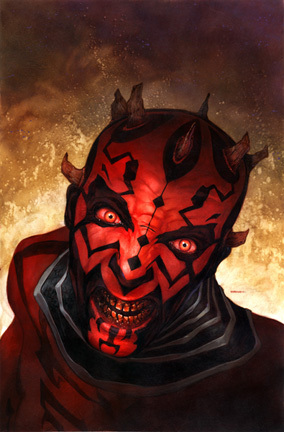 These are STAR WARS paintings that have been used as covers for Dark Horse Comics. I don’t usually offer my original paintings on my blog, but I felt this would be the best way to get the word out that these pieces are available, and to offer to my fans an exclusive opportunity to purchase some art without having to travel to a convention or signing. The art is listed on my webpage http://www.davedorman.com/sworiginalart.shtml with purchase buttons for PAYPAL. These are one-of-a-kind paintings, not prints. All of these original pieces are oil and acrylic on gessoed illustration board. They are 20″ x 30″ in size. Take a look at the art below and visit the webpage. If you have any questions please feel free to email me directly dormanart@yahoo.com. As always, I thank you for reading, getting in touch, and supporting my work. I’ll keep you posted on my digital efforts. First Look: Dave Dorman Original Wizard of Oz Art Premieres This Weekend at VISIONS OF OZ Show in L.A.
LOS ANGELES, CA—March 1, 2013— Dave Dorman’s “Dorothy Daydreams” original painting will be included in the upcoming Creature Features Visions of Oz gallery art show being held at the Heritage Square Museum in Los Angeles, California from March 3 – 31. Dorman’s painting, rendered traditionally in oil and acrylic mediums, is a visual homage to the L. Frank Baum literary classic Oz books. Said Dorman, “It was an honor to be invited to participate in this tribute. 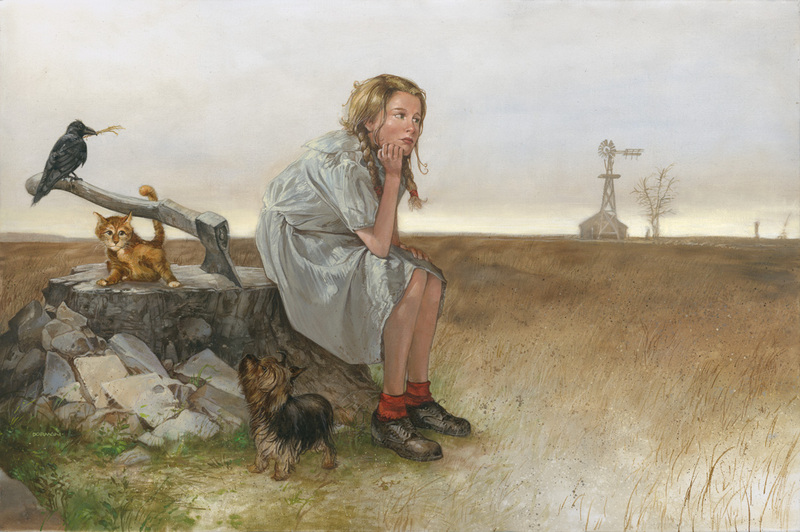 For Dorothy Daydreams, I returned to the spirit of L. Frank Baum’s young protagonist, capturing some of her desire to escape the harsh and desolate reality of her Kansas dustbowl farm for the fantasy of a much more colorful, imaginary world.” Dorman will be showing the art progressives from pencil illustration to final painting this weekend on this blog. Creature Features curated this multimedia exhibit, showcasing more than 100 works from a diverse group of artists. The collection includes illustrations, paintings, sculptures and full-sized recreations of favorite Oz characters. Also included in the exhibit will be historical memorabilia such as rare editions of the original L. Frank Baum books, props, concepts and artwork from various Oz-themed film & TV projects and many more surprises. Museum tours are $10; OZ exhibit-only admittance is $5. For more information, visit CreatureFeatures.com/VisionsofOz or call (323) 225-2700. Heritage Square Museum is located at 3800 Homer Street, Los Angeles. The museum’s website is http://heritagesquare.org. 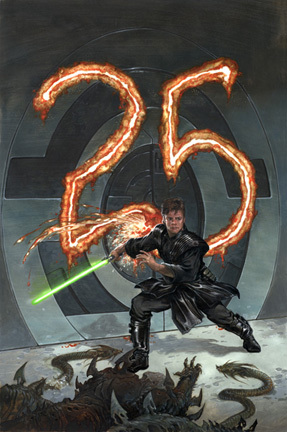 Eisner, Inkpot and Bram Stoker Award-winning illustrator, writer and creator Dave Dorman was voted the #1 Star Wars Artist of All Time by fans of the property worldwide, and his art book Star Wars: The Art of Dave Dorman was an international bestseller. His landmark, critically acclaimed graphic novel, Aliens: Tribes, won him an Eisner and Bram Stoker Award as well as changing the way the publishing ad entertainment industries viewed the medium. Dorman’s own critically acclaimed Intellectual Property, The Wasted Lands—the Sergio Leone-meets-motorcycle western epic tale of good vs. evil in a dystopian society recovering from “the Iron Wars”–continued to raise the bar in the graphic novel publishing arena and set a new standard. Another Dorman I.P., Dead Heat, is the Bram Stoker Award-winning horror anthology of his tales of the protagonist motorcycle zombie known as “Hitch.” Dorman’s autobiography, Rolling Thunder: The Art of Dave Dorman (IDW Publishing/Desperado Publishing) encompasses an estimated one-third of his illustrious art career, which includes licensed works of such classic properties as G.I. Joe, Indiana Jones, Predator, Robotech, Batman, Captain America, Spiderman, Judge Dredd, Transformers, Green Lantern, Green Hornet, Harry Potter, Lord of the Rings, Star Trek, Battlestar Galactica, Magic: The Gathering, Dungeons & Dragons, World of Warcraft and many more. Corporate clients include 20th Century Fox, Rhythm & Hues, Hasbro, Wizards of the Coast, Marvel, DC, Dark Horse, Image, IDW, Upper Deck, Topps, FASA Corp., and many more. Dorman is a sought-after instructor who has taught at American Academy of Art, Savannah College of Art & Design, Reverie (Massive Black/ConceptArt.org), Columbia College and The Gnomon School. His video art tutorials are available at The Gnomon Workshop. 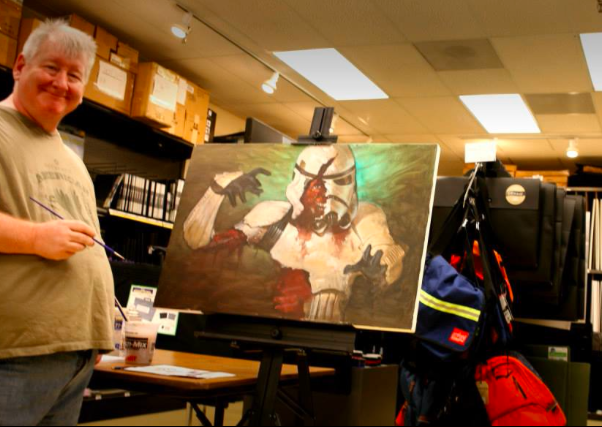 Los Angeles, CA and Chicago, IL—April 20, 2012—In their first creative collaboration, #1 Star Wars Artist Dave Dorman is creating the cover art for The X-Files and Lone Gunmen actor and “The Truth is Out There” filmmaker Dean Haglund. Haglund’s new graphic novel “Shock ‘N Awesome” is currently a Kickstarter.com campaign and promises a conspiracy theory lovers tale, unveiling the very Indiana Jones-like truth behind the U.S. invasion of Iraq in 2003. Hint: It wasn’t oil. “Dean and I have kicked around some collaborative ideas over the years, but this one feels right to me,” said Dorman. “I am thrilled that someone of Dave’s caliber is working with me on this creative adventure. I believe Dave’s cover art will excite people enough to meet my Kickstarter goal,” Haglund added. Shock ‘N Awesome currently has $4,257 in contributions with 23 more days remaining to earn the total $7,000 required to produce the graphic novel. If funding goes according to plan, Haglund hopes to have the graphic novel ready in time for San Diego Comic-Con, and an autograph session at Dorman’s Booth #4500. Haglund will publish an initial run of 1,000 issues to be distributed through Diamond. For more information, please visit http://deanhaglund.com or http://www.kickstarter.com/projects/deanhaglund/shock-n-awesome-graphic-novel. Dean is probably best known for his nine seasons playing Langly, one of the computer geeks known as “The Lone Gunmen” from the hit FOX TV series The X-Files. Today, Dean’s visual art is now collected worldwide. His oil paintings combine an unabashed Graphic Novel sensibility, using classic compositions and images from iconic Americana. Modern allegories and metaphors arise from a heavily researched catalogue of past works using the emotional/ theatrical tableaus with re-stated contemporary themes and cultural touchstones to evoke new meaning. Dean headlines with his unique ONE MAN X-FILES IMPROV COMEDY show at comedy clubs, colleges and comedy festivals around the world, which earned him 4-star reviews from the International Edinburgh Fringe Festival, two years in a row. 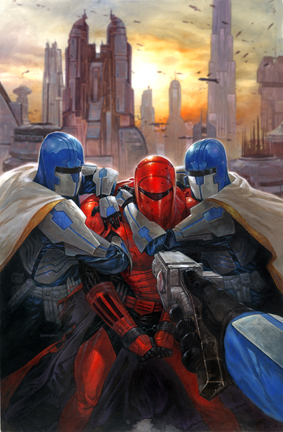 For the past 30 years, Eisner and Inkpot Award-winning artist Dave Dorman’s dynamic, hyper-realism art has boosted toy and comic book sales for those art directors wise enough to hire him. His fan base is worldwide. 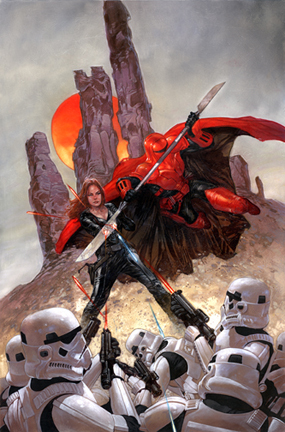 In 2012 Dorman did the six covers completing the Dark Horse Star Wars “Crimson Empire” series, and is currently creating the covers for the new four-book “Darth Maul” series. His Captain America art also appears in the new Marvel pop-up book Super Heroes vs. Villains: An Explosive Pop-Up of Rivalries slated for a July 2012 release. His autobiography, “Rolling Thunder: The Art of Dave Dorman” (IDW Publishing/Desperado Publishing) is available on Amazon.com and his 2-part instructional series on pencil and oil illustration is available via The Gnomon Workshop. 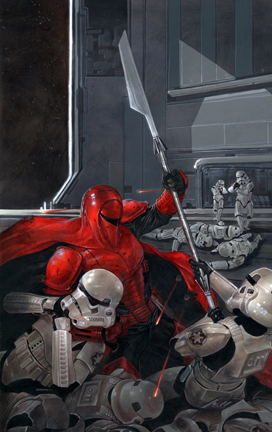 This year, Dave Dorman will be exhibiting this year at Spectrum, San Diego Comic-Con Booth #4500 and Star Wars Celebration 6. His one-man art show, “Pi ala Mode” just completed its April run Chicago’s Rotofugi art gallery. It all started this past Thanksgiving. We were with our friends, and my friend’s step-dad was very excited to meet me, have me sign my Rolling Thunder: The Art of Dave Dorman book for him, and then watch me draw the remarque and just generally hang out all day and talk art and pop culture. Our friends Mary and Julie lamented that this was a rare occurrence for a fan to have personal access to me, and that got this whole crazy ball rolling. Before I knew it, my wife, Mary and Julie had a night planned out at my house, with Julie cooking a gourmet meal (she’s great), and the fans getting unprecedented access to my studio, my collections and a chance to see me painting live and in person. That’s how this whole thing developed. So, we’ve worked out the logistics, such as when it should be held (April 14th, during C2E2, altho’ not affiliated with C2E2 in any way), how to get the fans here (by limo) and what we should include. I will do a live painting demo while everyone’s here, and one of the Lucky Six will win the painting. So…here’s the eBay auction under my wife’s account, which will award one seat per week for the next 3 weeks. I will also post an auction under my account, awarding one seat per week for the next 3 weeks. We will end up with what we’re calling the “Lucky 6,” or six fans, who will get an unprecedented backstage pass to my private world and art. If any of the winners are artists, they will also get a portfolio review, critique and all of the advice they could possibly want. Also joining us will be Discovery TV’s host of GEEK LOVE, and founder of Sci-Fi Speed Dating, Ryan Glitch and his lovely fiancee’ and business partner. I also want to let you know that ROTOFUGI, one of the hottest, hipster galleries in Chicago for the Juxtapoz/Hi-Fructose magazines and designer toy collectors crowd, has invited me to do a one-man show from April 6th – 30th. I am enormously honored. The timing on this is wonderful, because anyone rolling into town for C2E2 April 12 – 14 can easily cab it over to ROTOFUGI for my one-man show. 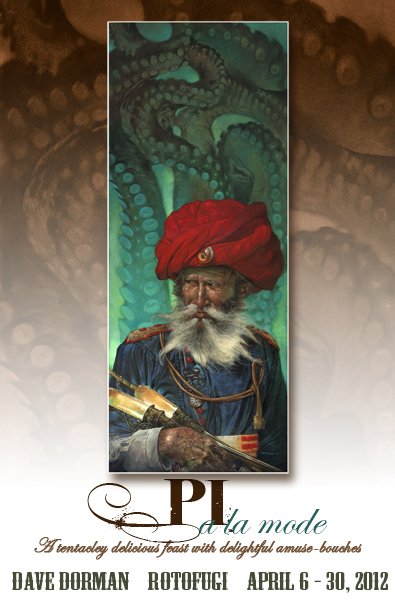 I’ve named the show Pi Ala Mode: A Tentacley Delicious Feast with Delightful Amuse-Bouches. As you might have guessed, there will be plenty of octopi-laden art, along with a backdrop of eclectic pieces, something to delight anyone’s palate and/or palette, from my 30-year career. I will have more fun news to post in my next blog about some really fun and creatively rewarding upcoming projects. I’m under embargo not to discuss them until the companies I’m working with do their press releases, or I’d love to be telling you already. I hope all of you Star Wars friends reading this have picked up my latest Dark Horse Comics Crimson Empire book (#5 in the series of 6). As always, I thank you for reading and for your time and interest.